People and Power is the name of the documentary made by Kouross Esmaeili about the Majles elections that just took place in Iran. It was apparently shown on Aljazeera but you can find its Part I and Part II on youtube. I think it is a well done documentary, showing aspects of Iranian politics not usually seen in the Western media. Interviews are done with candidates in Tehran from different political inclinations (conservative, independent conservative, and reformist). You can also listen to the arguments these candidates use to talk to their constituents and the impact US threats of military action against Iran has on these arguments. The current (May-June 2008) issue of The American Interest includes a debate on long-term strategy in Afghanistan. Army Colonel Thomas Lynch argues that only a long-term U.S.-Afghanistan security treaty, combined with reassertion of the U.S. lead of the international forces, will stabilize the country by signaling to all and sundry that the U.S. will not leave. I respond that unilateral commitments will only provoke more resistance from Afghans and regional powers, and that Afghan stability ultimately depends on lowering the level of threat through multilateral diplomacy and political negotiations. Such debates are a regular feature of this relatively new journal. The plan . . . is a mid-term three- year proposal costing about $4 billion and aims at reducing the insurgency by 30 per cent. Its other objectives are the reduction of attacks on security forces, sharply curtailing suicide bombings, the retrieval of physical space lost to the militants and re-establishing the writ of the state. Some of the highlights of the plan are: an increase of 14,000 men in the police and the constabulary, establishment of permanent regional religious peace conferences, and regulating the entry and qualification of prayer leaders. A Rs600 million rural endowment fund will be established for mobilisation of 4,000 village peace committees. Besides their role in securitisation of rural areas, they will work in tandem with other rural organisations for distribution of micro credit and other services. Five hundred madressahs will be upgraded for imparting marketable skills to students. One of the core programmes is the rehabilitation of 12,000 former militants. To reduce poverty, 7,000 new jobs per annum are planned for educated youths. More than ten thousand new daily wages jobs will be provided through implementation of infrastructure projects. The debate on the peace plan provides an opportunity to positively influence the security policies of the US in this region. If global security requires Pakistan to remedy a socio-political crisis emerging from an Islamist movement in Pakistan, then, in all fairness, it must be ensured that an indigenous Pakistani plan is used for solving the problem. Only a few days ago, the US accountability office criticised the US executive branch and stated: "The United States has not met its national security goals to destroy terrorist threats and close the safe haven in Pakistan"s FATA." It then went on to say that the US relied on the Pakistani military to address US national security goals. I will provide further documentation on this plan and related plans for the Federally Administered Tribal Agencies as it becomes available. Meanwhile I strongly recommend Aziz's article. [In response to comments: Warning! Title and text may contain irony. Read at your own risk. In case of outrage, read links and think it over.] Ten days ago the new Chief Minister of Pakistan's Northwest Frontier Province (soon to be renamed Pakhtunkhwa) gave his inaugural speech to the Provincial Legislative Assembly. He promised that "in the next session of the provincial assembly we shall present a comprehensive peace plan for our province." He promised to look for "a negotiated settlement to the problem of militancy" despite "many rejectionists at local, regional and international levels with various agendas and positions who might jeopardize the process." At least somebody is working on a plan. The U.S Government's General Accountability Office (which, unaccountably, has continued to operate through the current administration) has issued a report entitled "Combating Terrorism: The United States Lacks Comprehensive Plan to Destroy the Terrorist Threat and Close the Safe Haven in Pakistan's Federally Administered Tribal Areas." Unlike, say, the "Patriot Act" or the "Protect America Act," in this case the title provides an accurate summary of the contents. This might be what Chief Minister Hoti had in mind by "rejectionist," but a more accurate term might be "oblivionist." Note the amount spent to support political reform: 0%. Some U.S. commanders are now pressing for more attacks by the U.S. inside FATA. For now, the administration has decided not to jeopardize relations with Pakistan's new democratic government by undermining its policy before it can even formulate it. There is indeed a serious question of how to balance the time required for a political solution that will isolate al-Qaida and eliminate its safe area permanently, and the potentially urgent threat posed by militants who are undermining the international effort in Afghanistan (not just a US effort) and may strike in Europe or even the U.S. again. For a balanced assessment of this problem, we turn to Peshawar, Pakistan, where Khalid Aziz, former chief secretary of NWFP, is responsible for much of the strategic thinking going into the government's peace plan. If a "class" and regional analysis of the insurgency is made, it will show that it is based on support of conservatives, who inhabit the poverty stricken and under-developed regions of the NWFP and tribal areas. In the NWFP, more than 33% and in FATA more than 45% of the population lives on or below the poverty line composed of those who earn $1 or less per day. The liberal economic development model followed in Pakistan since the late 1980s and based on diminishing public expenditure on education and health has forced a sizeable population to seek the services of madressahs and Islamic charities for their basic needs. A large majority of such persons are committed followers of the Islamist. This is the flip side of the liberal model of economic development and globalisation. Another significant social transformation of the 1980s was our involvement in the anti-Soviet war in Afghanistan. It was the emergence of "Jihadism" as the preferred Pakistani state policy. This ballooned with help from international Islamic charities, many of which focused on NWFP and FATA. This was a shift from state responsibility to private actors. The war in Afghanistan brought an immense amount of money and weaponry to this lightly policed and institutionally weak region. According to a reputable estimate, from 1979 to 1992, the Afghan-Pakistan duo received $66 billion worth of weapons from various countries! Thus a conservative Pakhtun society living in poverty was financially enriched and weaponised. To those who listened it sounded too good to be true! People wished to know basis of the optimism behind these stirring words. They wondered whether the hard non-state fighters, who were involved in war, could be swayed by rhetoric alone. They were also aware that the Tehrik-e-Taliban Pakistan [Taliban Movement of Pakistan] has laid down impractical pre-conditions before participation. These include the withdrawal of US forces from Afghanistan, withdrawal of the Pakistani military from FATA, and non-interference in the jihad against US forces in Afghanistan. At the same time the US has said that it has no intention of withdrawing from Afghanistan in the near future. Therefore, can any peace plan succeed in the face of such rigidities? On the other hand the Feb 18 election has clearly indicated that the people of Pakistan voted against militarism and violence. The Taliban recognise that resort to force alone will not lead to the achievement of their main political objective which is the creation of an Islamist Caliphate. However, while everyone waits for good sense to prevail, there may be forces amongst the non-state fighters planning another strike in the West. If that happens, one may be certain of an air war in FATA and this could lead to incalculable harm to Pakistan. This in a nutshell is the danger surrounding the process of talks. . . . Many conservative Pakhtuns believe that the fighting in Swat, Kohat and Waziristan is a war of liberation against US occupation of Afghanistan; they fight the Pakistani state because of its alliance with the US. However, it does not make it a US war alone. Whatever may be the case at the start, this is now Pakistan's war, since the objective of the insurgents is to change the nature of the Pakistani state. To fellow Pakistanis I would say that it is our war, whether we like it or not. Compare what Aziz has written to General Musharraf's speech on September 19, 2001, when he told Pakistan that his aim was to "save Afghanistan and Taliban." What Musharraf said in that speech was that supporting the war against the Taliban was the "lesser of two difficulties," compared to driving the U.S. into the arms of India. All negotiations with militants pursued by Musharraf's government had as their aim to balance the imperative of acting against al-Qaida with that of saving the Taliban as a strategic asset for Pakistan. Aziz says the opposite: the Taliban and other militants are fighting "to change the nature of the Pakistani state," and that therefore "It is our war, whether we like it or not." Negotiations in support of the expansion of democracy and federalism in Pakistan are not the same as negotiations in support of balancing military action against al-Qaida with preservation of the Afghan Taliban. The program of the new government in Pakistan and NWFP, unlike that of Musharraf, corresponds to the aspirations of the majority of people in the NWFP and FATA, including many conservatives, and it can win their support. If negotiations do not suffice to disarm the militants, the required military action, in support of an elected government trying to extend democracy and social services, will gain far more domestic support in Pakistan than Musharraf's balancing act ever could have. This government of Pakistan has articulated goals consistent with international objectives in the region and believes in pursuing negotiations in support of those goals without abandoning its own vision of a stable democratic Pakistan at peace with its neighbors. In Congressional testimony this month, a former top American commander in Afghanistan said the need for more action was urgent. “A senior member of the administration needs to go to Pakistan and take the intelligence we have on Al Qaeda, the Taliban, the Haqqani network inside of Pakistan and lay it out for their most senior leadership,” said the retired commander, Lt. Gen. David W. Barno. I'm not sure what the new government supposedly does not know about; in my experience the Pashtun nationalists had better intelligence than what I heard from the US government. But we now have a full partner in Pakistan, elected, ironically enough, by Pakistani voters angry at what the GAO calls the "lack of a comprehensive plan," rather than just a military approach. It is indeed time to "sit down and think through what we can collectively do" with these partners. LET ONE HUNDRED BOYCOTTS BLOOM! Boycott CNN! Boycott Carrefour! Boycott anyone who boycotts the Olympics! Boycotts are a blunt instrument, albeit drawn from the trusty democratic toolbox. That boycott fever seems to be the mood on the streets of China these days is a testament to how discontent with domestic problems has been eclipsed by disappointment with the West. China, isolated and ostracized for decades because of its rejection of capitalism and a Western-dominated economic system, at last abandons its homegrown revolutionary system for an open-door, pro-business, pro-trade system, abiding by rules created by others, joining international organizations dominated by others. Chinese doff the dusty Mao jacket and communal economic arrangements to imitate the West. What is imitation if not a kind of flattery? China’s nouveau riche don the suit and tie, imbibe the MBA and CEO lifetyle, they sip champagne and smoke cigars in five-star hotel lobby and trade tips on golf courses likeWestern businessmen—and they still get no respect. And if the most powerful people in China get no respect, imagine how the ordinary people feel. Lack of respect is central to the informal eruptions of popular Chinese anger in the street in recent years, whether it be anti-Japan, anti-France or anti-CNN movements. Whether the issue at hand is being portrayed as willing idiots in Japanese textbooks, or being treated with dismissive disdain by the French President or being manipulated by US government backed destabilizers such as the National Endowment for Democracy, Radio Free Asia and the CIA-tinged Free Tibet movement, the resentment is real. Beijing’s Olympic bid is hard won and ordinary Chinese people have made considerable sacrifices; not just incessant labor and heavy infrastructure investment, but spiritual sacrifices as well. Chinese have been called on by their own leaders, no less than foreign ones, to give-up a traditional way of doing things in favor adopting the norms of a global capitalist system dominated by powerful Western actors. It’s a system in which the rich get richer, as can be seen in America and increasingly in China. No wonder boycotts make businessmen nervous. How can you keep your head up when you are asked to reject your own way of life but are not fully accepted by the arbitrers of the new rules? Japan felt this way after the heyday of Meiji and Taisho era Westernization; no matter what it did it could never really join the Western club. Angered at Western racism, documented and affirmed by W.E.B DuBois among others, Japan in the Showa era came up with a racist response of its own, The Greater East Asia Co-Prosperity Sphere. It is not because Chinese are arrogant and xenophobic that they resent being misled and misrepresented by CNN and Time; it is because they had the humility and the cosmopolitan savvy in the first place to accept the notion that the Western media was superior to their own that they are now shocked to see how shoddy, jingoistic and biased it can be. Teaching journalism in China for the US-based Knight Foundation was an eye-opener for me. My appointment to be what was in effect a journalistic missionary included a week-long orientation in Washington, DC at which we were reminded that American journalism was the gold standard, fair and uncorruptible; that’s why the Chinese and other foreigners needed to learn from us. After spending several subsequent years doing media research in China as an academic, I can safely conclude that it’s not so white and black as US boosters would have it. The Chinese media is not as bad as we think it is, the American media is not as good as we’ve been taught to think. To offer but one example, the American media misled the US public into a ruinous war in Iraq, and yet is has yet to come clean about conflicts of interest, jingoistic tendencies, and compromised access to power. Nowadays Amerians are mad at US media, so why shouldn’t Chinese be? When you come to believe in something, or more critically rely on something to make informed choices as a citizen and responsible member of the global community, bad information from the most reputable information providers puts everyone in a quandary. What is one to do? Turn off the TV, cancel the newspaper subscription and go online, reading opinioinated blogs all day? Deviations from the standard inevitably dismay and disappoint. As we enter this season of boycotts and protests, we learn from the usually reliable New York Times that the Pentagon has been spoon-feeding TV networks with misinformation and spin on Iraq. It might be a good time for all responsible information disseminators --commercial TV, state TV, news agencies and newpapers-- to clean house of paid propagandists and jingoists and get back to the basics of journalism. Meanwhile, let one hundred boycotts bloom! The boycotts may cause a temporary dip in profits or lose of face, but again, imitation is the highest form of flattery. Chinese protesters have taken note of the Farrows and Free Tibeters and Spielbergs and Sarkozys of the world and they extend the compliment. You boycott us, and we will boycott you. Mahmoud Ahmadinejad went to Qom and gave a rather bombastic economic speech even in comparison to his usual standards. The contours of his speech were not that different from the one he gave last week in Mashad but the details were both interesting and revealing in terms of how he sees himself vis-à-vis what he considers to be the powerful and corrupt entrenched interests or forces in the Islamic republic that prevent him from doing his job and fulfilling his campaign promise of pursuing economic justice. His demeanor was strident as usual; added was the element of exasperation. Like his Mashad speech, Ahmadinejad highlighted his hard work and success against foreign powers who have tried hard to import a “70 percent inflation” rate into Iran. It was his administration’s efforts, he said again, that presumably limited the damage to only 20 percent (more than 8 percent above what it was when Khatami left office)! He also lambasted the powerful domestic mafia and powerful political forces that have joined the foreign powers in stunting his economic plans. But ironically the detailed explanation of where these powerful forces are located ended up revealing his belief that these sinister economic forces are also operating within his own administration. Come to think of it, this is an astounding argument, essentially saying that the people he appointed himself to run Iran’s economy did not and are not doing what they are supposed to do, which is to carry his orders. This is presumably why he just sacked one of the folks who was not carrying his order: the finance and economic minister, Davoud Danesh-jafari. It is important to understand the backdrop to this argument. Like in many other countries, these are turbulent economic times in Iran. There is no doubt that inflation rate has picked up substantially, officially inching above 20 percent and unofficially, particularly in the housing market, well above that percentage. Inflation is obviously harming the poor and the middle class more than those with abundant assets. Economists had warned Ahmadinejad about the inflationary impact of his expansionist economic policies since he embarked upon them. At this point, Ahmadinejad’s options are to acknowledge his mistaken policies and begin a re-direction (which the Iranian economist say will take a couple of years – well beyond the 2009 presidential election – to begin to have an impact) or look for sources of the problem elsewhere. The desire and urge for confronting mafias and powerful economic interests has been part of the Iranian political dynamics and discourse since the 1979 revolution. In fact, last week, Hossein Shariatmadari, the editor of conservative Kayhan, wrote an editorial essentially acknowledging runaway inflation in the housing market and food prices and also acknowledging that they hurt the poor and not the rich. He, however, said that this inflationary trend cannot really be blamed on policies of a government that is clearly dedicated to combating inflation. The problem, he also said, must be found in the control of various sectors of the Iranian economy by economic mafias and the rich. All in all, it was a scary editorial, hinting at the possibility of attacks against “those who are causing inflation” Incidentally, it sounded very much like the promotion of anti-profiteering campaign pursued by the Shah immediately before he fell in 1979, which blamed individual entrepreneurs for inflationary policies and expansion of money supply because of the uncontrolled infusion of oil money into the Iranian economy. Shariatmadari’s editorial immediately elicited a response from a conservative member of the parliament (a cleric to boot) who reminded Shariatmadari that all the inflationary consequences of Ahmadinejad’s 2006 and 2007 budgets were predicted; hence, he pointed out, the conversation should revolve around correction of wrong headed policies and not scapegoating. And here lies Ahmadinejad's problem in convincing the Iranian elite in Qom or elsewhere that the best policy is to go after the economically powerful and the rich. To boot, of course, is the reality that the Iranian establishment does not have much reason to support a president who, at least rhetorically, wants to attack their economic interests. These disagreements essentially leave Ahmadinejad with policy confusion and not much beyond fiery speeches attacking members of his own conservative administration, and also attacking the conservative-controlled judicial system, and government-controlled banks for not following his orders or bringing charges against corrupt individuals, and preventing his pursuit of economic reform and justice. This predicament was perhaps why Ahmadinejad ended up canceling the major economic speech he was supposed to give on the Iranian television, reportedly to announce a plan for the monetization of more targeted subsidies. Conflicts within his own administration over how to deal with runaway subsidies and what to do with the interest rate (raise it by indexing it to inflation or not) prevented the announcement of his new economic plans, at least for now. At this point, it is perhaps worth remembering that by the last year of his first presidential term, Mohammad Khatami was also bemoaning his lack of power against the systemic forces that were stunting his agenda of political reform. But at least he was not complaining about his own cabinet or his own political wing – the reformers -not doing what he tells them to do. Rubin: More Misleading Talking Points on Drugs in Afghanistan from UNODC, USG, etc. Poppy harvest is approaching, and it's eradication time in southern Afghanistan! This is as good a time as any to look back on the debate I have been having with UNODC and the US Government over the relationship of the drug economy to poverty and counter-narcotics strategy. My colleague Jake Sherman and I presented our findings and analysis in a report released in February (cover, left), which included in an appendix a letter that I wrote to the administrator of UNODC, Antonio Maria Costa. Militants launched two attacks against Afghanistan's vulnerable police, killing eight officers, including four who were destroying a field of opium poppies, officials said Sunday. Kandahar provincial police chief Sayed Agha Saqib said the militants killed four eradication police in the province's Maiwand district on Saturday. The attack is at least the third time militants have targeted such teams in the last several weeks and comes one week after fighters killed seven officers who were eradicating poppies. Saqib has said police would increase the teams' protection. Around 100 officers on the country's poppy eradication force were killed in the line of duty over the last year, the Interior Ministry has said. Harjit Sajjan, a police detective from Vancouver, British Columbia, served in military intelligence with the Canadian Land Forces in Kandahar. His work with the local population was key to halting the Taliban offensive in the summer of 2006. Detective (Major-Reserves) Sajjan wrote me a note about his observations, which also appears as an appendix in our report. In his frontline experience, "The current eradication program is pushing the farmers to the Taliban," because "eradication impacts the farmers who are trying to feed their families." A U.S. official with responsibility for counter-narcotics in Afghanistan wrote me to share his opinion that our report was "So inaccurate as to border on dishonest." A senior international official with lengthy experience in Afghanistan and many other war-torn countries (including his own) found the report to be "better than anything ever written on the subject by UNODC or anyone else." UNODC has responded to arguments made by us and other critics. I have also been involved in a number of private exchanges on these matters. 1. Refuting distortions: We and other critics argue that crop eradication in insecure areas disproportionately hurts the poorest people involved in the opium economy, because the sharecroppers and laborers in insecure and isolated areas have the fewest alternatives. UNODC responds that "poverty does not appear to have been the main driving factor in the expansion of opium poppy cultivation in recent years," which is a valid response to a claim no one has made. The US government responds to the "myth" that "Afghan poppy is only grown by poor farmers" (another claim no one has made), arguing that "In the South, where most of the poppy is now grown, cultivation is organized by wealthy traffickers and big landowners who plant poppy because of high profits and the absence of law enforcement in insecure areas." The opium economy is controlled by rich people who are seeking profit! Imagine that! The US and UK claim that they "are helping the Afghan Government to target eradication at the wealthy, not the poor" (I can't link to this source). Besides the ludicrous idea that the US and UK have better information on land tenure in rural Afghanistan than the Afghan government (see this), I have yet to receive an explanation, even in response to direct questions, of how the US and UK intend to target rich landowners without targeting their poor sharecroppers and laborers. I'm still waiting. UNODC and the two governments nowhere in their recent arguments acknowledge the existence of sharecroppers and laborers. I shall come back to how they use sloppy language to disguise sloppy thought, with potentially the same disastrous results that George Orwell warned about in "Politics and the English Language" (the points apply to any language, not just English). 2. Dogmatic formulae: we argue that eradication should be used only in secure areas where licit livelihoods are available and communities have confidence in them (which by the way, is the official policy of the Afghan government, which the US and UK have overruled with their pressure tactics). A recent report by UNODC demonstrates that alternative livelihood programs reduce poppy cultivation only in secure areas; it stands to reason that the same is true of eradication. Security is what we social scientists call a"contextual variable." Where life is relatively secure and government can operate, alternative livelihood programs lead communities to reduce poppy cultivation, and (a reasonable hypothesis) a credible threat of eradication does likewise. Where there is little or no security, however, alternative livelihood programs are used for corruption or to improve the yield of illicit crops (as in Helmand), and eradication leads communities to support the insurgents. Hence security -- above all a political issue -- must come first. Rather than engage this argument, the US and UK respond with the dogma that "Virtually every successful anti-opium campaign in history has required a downside risk to deter poppy cultivation at the level of the individual farmer, and eradication is just one risk factor among many." If either government has an answer to our arguments about the sequencing and contextual requirements for eradication to succeed, I have yet to hear it. The fact that "some" downside risk is necessary provides no evidence that any and all downside risk is effective. Evidence (which we cite) indicates that the downside risk created by the current policy of eradication in insecure areas drives communities to turn against the government rather than to move out of the drug economy. I would welcome a genuine argument against this evidence, if there is one. 3. Changing the subject: We argue, and the US and UK governments claim to agree, that the principal target of counter-narcotics policy in a situation that combines counter-insurgency in some areas and peace building in others is narcotics profit that funds insurgency and corruption. All evidence indicates that traffickers and their political-military protectors, not rural communities engaging in cultivation, receive 70-80 percent of the gross profits of narcotics in Afghanistan. We also argue that crop eradication has no effect or a harmful effect on curbing narcotics profits, by moving cultivation around, raising the price of raw opium, and driving traffickers to seek profit higher on the value chain (as they have done). We also argue that it is futile to try to de-fund the Taliban and al-Qaida through counter-narcotics policies, because they have alternative sources of funding. The US-UK response? The opium trade and the insurgency are closely related. Poppy cultivation and insurgent violence are correlated geographically, and opium now provides the Taliban with a portion of its revenues. Fine. There is a correlation between insecurity and poppy cultivation. As we argue in our report, the causality is primarily from insecurity (which has political causes) to poppy cultivation, not vice versa, but the US and UK governments apparently do not recognize the distinction between correlation and causality. Yes, the Taliban get part of their revenue from poppy production. I daresay that every significant political group in Afghanistan, including the Taliban, derives a portion of its revenue directly or indirectly from the narcotics economy. This obvious fact, however, in no way responds to the argument that crop eradication has at best a neutral effect on the amount of illicit funding generated by the drug economy, and that such funding is best addressed by interdiction, including interdiction of the imports of precursor chemicals into Afghanistan from other countries. This might seem a little wonky... and thoroughly analytical. When I started posting on this blog, I warned readers that I was a senior research scientist. But there is a very important political point: UNODC and the US Government use what Orwell called a "mixture of vagueness and sheer incompetence" to create prose that "consists less and less of words chosen for the sake of their meaning, and more and more of phrases tacked together like the sections of a prefabricated henhouse." A mass of words "falls upon the facts like soft snow, blurring the outline and covering up all the details." To defend the indefensible, "political language has to consist largely of euphemism, question-begging and sheer cloudy vagueness." First, opium cultivation in Afghanistan is no longer associated with poverty – quite the opposite. Hilmand, Kandahar and three other opium-producing provinces in the south are the richest and most fertile, in the past the breadbasket of the nation and a main source of earnings. They have now opted for illicit opium on an unprecedented scale (5,744 tons), while the much poorer northern region is abandoning the poppy crops. Second, opium cultivation in Afghanistan is now closely linked to insurgency. The Taliban today control vast swathes of land in Hilmand, Kandahar and along the Pakistani border. By preventing national authorities and international agencies from working, insurgents have allowed greed and corruption to turn orchards, wheat and vegetable fields into poppy fields. Quite a target-rich environment. (If UNODC is like other organizations with which I have experience, politicos in the front office wrote these paragraphs, not researchers, who might be embarrassed by them.) Both paragraphs start with sentences using extremely vague verbs in the passive voice, as if UNODC were using Orwell as a source of negative inspiration. Opium cultivation "is no longer associated" with poverty. Opium cultivation "is now closely linked" to insurgency. There are no human beings in these sentences, just abstractions that might be linked or associated to each other. Taken on their own terms, such sloppy assertions mean very little. But these statements cannot be taken on their own terms: UNODC's leadership is making these assertions as interventions in a political struggle over Afghanistan. UNODC has produced a whole "discussion paper" about whether "poverty" is the "main driver" of opium cultivation. Not surprisingly, UNODC finds that both rich and poor participate in Afghanistan's largest industry. Only a UN Agency could think this finding worthy of reporting. But the argument over poverty and opium cultivation has nothing to do with such banal truisms. Hilmand, Kandahar and three other opium-producing provinces in the south have now opted for illicit opium on an unprecedented scale (5,744 tons), while the much poorer northern region is abandoning the poppy crops. Apparently in southern Afghanistan provinces make decisions about opium cultivation, whereas in the north the entire region decides together. And these "rich" southern provinces (though the three "other" ones are actually much poorer than most of the north) have made the wrong decision, while the poor but virtuous North has made the right one. 10 Apr, Balkh Province, Balkh District, Kata Khel Village – One person was arrested for the possessions of narcotics and weapons. Eighty two kilograms of Opium, a shotgun and an AK-47 was seized from them. First, the argument about the relationship of poverty to the drug economy refers to the poverty of the entire country of Afghanistan, not just relative poverty within Afghanistan. Afghanistan is tied for last place in human development and security indicators as the poorest country and most insecure in the world along with a handful of African countries. It has been ravaged by thirty years of war that destroyed physical, human, and social capital, in which the opium economy was a survival strategy from which some profited handsomely. Second, though rich and poor both profit from the drug economy (and, tautologically enough, the rich profit more), the poor are the most dependent on the drug economy for survival, especially in insecure areas. Therefore forced eradication in the so-called "rich" province of Helmand, where average incomes are $1 per person per day, disproportionately hurts the poor. That the poppy may be grown on land owned by the relatively wealthy has no bearing except as magician's business drawing attention away from the actual trick being performed. The main point is not care for the least among us (though I confess a certain such concern), but that eradication in insecure areas drives the poor (the vast majority) to seek protection from the insurgents (see opening of this post). But these actual people, their motives, alternatives, and choices, do not exist in the UNODC language fog. The second paragraph is worse. I already noted that by itself a correlation of insurgency or insecurity with poppy cultivation cannot explain anything or argue for any policy. That depends on how policy interventions affect the choices of human beings. But in UNODC's language there aren't any human beings! Just "insurgents," who "have allowed greed and corruption to turn orchards, wheat and vegetable fields into poppy fields." Thus UNODC technically avoids saying that the Pashtuns of southern Afghanistan, unlike the virtuous other ethnic groups of northern Afghanistan are greedy and corrupt. (Nonetheless, this is what some Afghans understand them to be saying, and is another reason that this approach is highly irresponsible.) Apparently "Greed" and "Corruption" are political and economic actors in southern Afghanistan, and they must be struck down by "Counter-Narcotics" and "Counter-Insurgency," as if Pilgrim's Progress had come to Afghanistan. This language situates us in a metaphorical world of abstraction, rather than the real world of violent struggle among some of the world's poorest and most traumatized people. We are engaged in an apocalyptic struggle with Greed, Corruption, and even, dare I say... Evil! How can anyone oppose measures against Greed and Corruption? Thus by conveniently removing the Afghans from Afghanistan, UNODC and the governments that fund it justify carrying out counter-narcotics policies driven by ideology and bureaucratic interest against the interest not only of Afghans but of all those who wish to see a secure and stable Afghanistan. Today, production is increasingly concentrated in five southern provinces where the security situation is most acute. This makes it vital that alternatives to opium address the problems of these vulnerable rural farmers by supporting their access to land, credit, food security, and sustainable economic livelihoods. post-war reconstruction are made even more difficult by the continuing insurgency, by the age-old centrifugal forces that have always made Afghanistan hard to govern, by the extreme weakness of modern institutions, and by widespread corruption and lack of rule of law. illicit opiates, accounting for over 90% of world production and trade. Total gross revenues from the illegal drug trade in Afghanistan are equivalent to over one-third of licit GDP. Millions of Afghans benefit directly or indirectly from the opium economy. progressively reduce opium production over time. Where farmers are better off and clearly have viable alternatives, law enforcement measures can be taken. Where farmers are poor, or where landless labourers are involved, government policy is to develop viable alternatives for the rural poor, and only then [my emphasis -BRR] use sterner measures to enforce a ban on opium poppy cultivation. 1. Better-off farmers who are not dependent on opium. The exit of these farmers from the opium economy is largely a function of security and governance, and of legal market opportunities. 3. Poor farmers in remote areas currently highly dependent on opium, with little potential to produce for the market and scant local labour opportunities. Over the longer term, these farmers can move away from opium if value can be added to local on-farm and off-farm production and to labour. Out-migration is likely to play a significant role for this group. (through wage labour or sharecropping). Adding value to labour, developing employment opportunities, and facilitating orderly migration are exit paths for this category over the longer term. Things like the continuance of British rule in India, the Russian purges and deportations, the dropping of the atom bombs on Japan, can indeed be defended, but only by arguments which are too brutal for most people to face, and which do not square with the professed aims of the political parties. Thus political language has to consist largely of euphemism, question-begging and sheer cloudy vagueness. The real argument in this case is that the struggle against terrorism takes priority over the welfare (or lives) of poor Afghan farmers. That is not an empirical proposition but a political one -- but one that those in power prefer not to articulate. On strictly empirical grounds, this political position is self-defeating. Without gaining the support of the poor majority of Afghanistan for a government integrated into the international system, we will never be able to secure the country and region against al-Qaida and its offshoots. In any case, as we have stated in arguments that have never been even acknowledged, let alone refuted, the existing policies will not reduce the funding of the Taliban and al-Qaida. Another disturbing trend is the steady rise in cannabis cultivation, giving Afghanistan the dubious distinction of being one of the world’s biggest suppliers of cannabis in addition to providing over 90% of the world’s illicit opium. And where is this cannabis grown? Substantial numbers of Afghan communities grow it in the main poppy producing provinces, but also in the "poppy-free" provinces of Paktya (50 percent of villages), Logar (33%), Sar-i Pul (33%), Baghlan (23%), and Balkh (22%). So the "poppy-free" provinces are not "narcotics-free." Their main alternative livelihood is not anything supplied by USAID, but another illegal narcotic! The US and UNODC conceal this fact through yet more deceptive use of language. In one sentence they are engaging in "counter-narcotics," and in the next they are succeeding because provinces are "poppy-free" (though they are full of cannabis plantations and drug traffickers). When reading any official pronouncements on this subject, look carefully to distingish among poppy, opium, heroin, trafficking, and narcotics. That will give you a better idea of the true landscape beneath the snowfall of verbiage. The Chapandez are the riders who have made Buzkashi the wildest, most uninhibited display of horsemanship in the world. Buzkashi is Afghanistan's national game, played for state visits and also on ceremonial occasions like the king's birthday. Chapandez convene at stadiums (this one at Kunduz), and form two teams of 30 to 100 men. The horsemen then fight for possession of a dead calf. A rider, at full gallop, with the calf in one hand and a whip in the other, tries to round a stake at the end of a 450 meter field — often flattening a few spectators on the way. The Chapandez in traditional costume, line up behind model Ann Cosyns in an American coat of embroidered pigskin, a silk-satin pouf skirt and bodice. What we miss: Bamiyan Buddhas (background, second picture). I received the charts below from Sami Kovanen, a Finnish security specialist in Kabul. The second chart compares the total number of incidents during these 13 weeks in both years, broken down by region (Central Highlands, Eastern Region, Southeast Region, Southern Region, Western Region, Northeast Region, Northern Region, and Central Region). 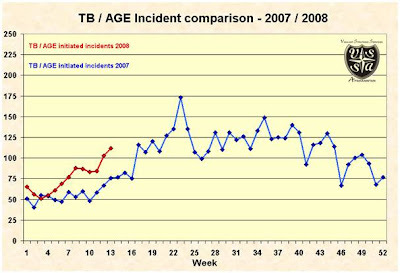 Incidents in 2008 are almost 40 percent more numerous than in 2007. Except for the Central Highlands Region, where the number of incidents is negligible, the largest proportionate increase is in the Central Region, which includes Kabul, Wardak, Logar, and Parwan, where incidents have increased by 70 percent. I have been told that incidents in Wardak have declined recently, since a commander of Hizb-i Islami was appointed as police chief, and he hired all of his old mujahidin. Further details or corrections welcome. Rubin: Chief Minister of Pakhtunkhwa (NWFP) -- "Peace in our province is not possible without peace in FATA. " The Awami National Party in Peshawar has distributed the text of the policy speech of Amir Haider Khan Hoti, Chief Minister of Pakhtunkhwa (former Northwest Frontier Province) in the Provincial assembly after taking a vote of confidence on April 10th 2008. Mr. Speaker, Esteemed members of the assembly. With your support and continued solidarity of this honorable house and the people of our Province, my team in the cabinet and I will deliver on the issues of basic and vital significance. I want to share priorities of our government in the first hundred days and to highlight some of the long term objectives. Our coalition government has come to office in a period of great upheaval for the people of this region. It is very painful to see that while rest of the World is advancing into higher stages of all-round development our province and FATA have been in the fore front of a tragic armed conflict imposed on us from outside. The dark forces of death and destruction have played havoc with our beautiful land and innocent people. I want the World to know that the land of Pakhtuns is not just about madness and fanaticism. It is the land of glorious Gandahara civilization. It is the land of illuminating Islamic Renaissance of central Asia. It is the land of Pir Rokhan and Baacha Khan. It is the land of Khushal Khan Khattak and Rehman Baba. In short it is the land of peace and brotherhood. The results of the recent election have proved it beyond any doubt that our people do not support a closed society. They are not for isolation. They want to join the mainstream and develop alongside the rest of the World. They have voted for peace, democracy and federalism. Dear friends, standing on the floor of this August house, I want to reassure the people of the country in general and this Province in particular that peace and security remains at the top of our agenda. The problem of violence, extremism and militancy faced by the people of our Province and in FATA is the outcome of flawed political policies of the past. In essence the problem is political with security as an important dimension of this problem. We are convinced that there is no military solution to the complex issues and challenges vis-à-vis peace and security intensified over the years due to flawed policies. We are therefore, essentially looking for political solutions for dealing with these issues and challenges we are all faced with. Our stance on politically negotiated settlement of the issues has received an overwhelming support by the people and we are committed to our promise to the people. We are also happy to note that a popular consensus has emerged on a negotiated settlement to the problem of militancy, not only among the political parties, but nearly all the state institutions are also in agreement with us on this point. Further, we have received credible signals from the dissidents that they are too are interested in a peace dialogue. However, while our commitments are firm on finding a negotiated settlement taking along all key stake holders, we do not wish to raise false hopes and expectations. We are well aware that there are many rejectionists at local, regional and international levels with various agendas and positions who might jeopardize the process. We are however, determined to find an indigenous solution with the participations of all genuine stakeholders. We shall not allow anyone to hold the entire Pukhtun belt as hostage. The Provincial government will announce a peace jirga of elders with representatives from a cross section of the society. In the next session of the Provincial Assembly we shall present a comprehensive peace plan for our Province and FATA. We shall actively seek the cooperation of the Federal Government on FATA as peace in our province is not possible without peace in FATA. During our tenure we would make sure that every child of school going age gets an opportunity to go to school. The Government is committed to providing free and quality education to all up to higher secondary level. We would appoint a committee of experts to prepare recommendations for providing education in mother tongue of the children at primary level. We would revise curriculum and focus on teachers training in the interest of quality education. We would also revise the salary and benefit package for teachers especially those working in difficult areas. Health and life insurance will be provided to the teachers at no cost to them. Further, travel and accommodation support will be ensured particularly for women teachers working in difficult and far flung areas. The government will also look into affordable housing schemes for government teachers. We shall also take the organizers of Deeni Madaris [madrasas] on board for seeking their cooperation in imparting technical training to young people. Children studying in these Deeni Madaris are an important part of our society and we would do everything in our power to provide a bright future to them. The Provincial government notes with grave concern the increase in the number of children ending up on the streets. The government will with the help of philanthropists’ set-up homes on the patterns of SOS villages for those children who are currently on the streets, after all they are our future generation. Our Government is committed to providing equal opportunities for women in education, employment and decision-making. We shall build and protect girls’ schools. We shall ensure that women are employed in higher bureaucracy against the set existing quotas. We shall form a Provincial Commission on the Status of Women which will work closely with the National Commission on the Status of Women in reviewing discriminatory laws and practices, prepare recommendations for change and monitor multiple forms of violence against women. Recognizing the fact that women in the Province lag behind on key human development indicators, therefore, our government will extend full support to the Ministry of Women’s Development for taking effective measures to bridge the gap. Programmes, policies and plans of each Ministry will be reviewed to ensure that they address gender concerns adequately. Special programmes for technical skills development and small and medium sized business will be initiated for women. Adequate credit schemes will be designed to suit the needs of women entrepreneurs. The government will also introduce special incentives for home-based women workers to encourage them. Environmental degradation is the one serious problem that can not only catch up with the problem of militancy and violence, but has the potential of undermining our future as a community of people. The worst part of the problem is that there is very little awareness about the hazards that we are confronted with in this area. Our first priority in this regard would be to launch a massive and consistent campaign for creating awareness in the masses about environmental issues. During the first hundred days we shall formulate a comprehensive policy for protecting our natural habitat and sustainable development in the province. We shall involve all the stake holders and civil society in formation of the policy. This province has a rich cultural heritage. But unfortunately our culture has borne the brunt of violence in recent years. The provincial government will use all its resources to revive our cultural heritage and put it on the path of development. We shall open Nishtar Hall for healthy cultural activities. [Nishtar Hall is the main venue for music and dance performances in Peshawar. It was closed by the Islamist government of the MMA.] The government will maintain effective check over obscenity and vulgarity according to law. We will organize a systematic interaction with artists to ascertain their problems and include their suggestions in resolving those problems. We shall declare a special package for the rehabilitation of artist community who had suffered colossal dislocation due to the discriminatory policies of the past government. The provincial government will proactively take measures for the promotion of Pashtu in terms of research and publications. Our government will respect cultural diversity in the province and would provide opportunities for the development of Hindko, Kohar and all the other languages spoken in this province. The provincial government will respect and protect independence of media. Our government will provide every support to improve the working conditions and financial remuneration of the working journalists. Jails will be transferred into reformatory institutions and redundant laws and rules will be amended to bring them in line with modern concepts. Scale and variety of diet will be enhanced. Lawyers, intellectual, civil society and people from all walks of life will be requested for suggestions for improvement of Criminal Justice System. Like the US, China is a continental power not fully cognizant of how impressive and intimidating she appears in the eyes of others. Given China's sudden growth spurt, global reach and budding supremacy, it is surprising to see how nervous and unsure of herself she is on the eve of the Olympics, widely dubbed a "coming out" party, as if China were a shy teenage girl. And yet despite the strengths so obvious to others, there is something distinctly naïve, insecure and adolescent, if not specifically girlish, about China's behavior in recent months; at once showy and unsure of her beauty, at once prone to narcissistic grooming and feeling soiled inside, at once full of herself and devoid of self-confidence. China's not an adolescent country by any standard historical reckoning, but the emerging civil society of ordinary Chinese citizens is young and tender. China's aspirations as a "normal" country in a world long-dominated by Western norms of trade, banking and diplomacy, including membership in WTO and other popular Western clubs, puts it well into its teens, but not much older than that. China is clearly an up and coming power, a presence to be reckoned with, and yet its booming growth is not deep-rooted, coming, as it does, on the heels of decades of trauma and isolation, imposed on the people both from without and within. China, after a century and a half of dismemberment and humiliation, remains peculiarly vulnerable to a sense of being violated. If there's the soul of a teenage girl lurking in there, she's got some extremely powerful bodyguards, but the insecurity persists. Bolstered by initial signs of acceptance and a tentative popularity despite the undue bullying that any new kid from a different school on the wrong side of the tracks in school might experience, China has made a tentative stepping out into international society. She has grudgingly earned respect from officials in the corridors of power in the West, but old prejudices linger and she is subject to being taunted, shunned and bullied on the street. One reason the new kid on the block is both respected and resented to a far greater degree than others is performance against expectation; she excels in almost any endeavor she puts her mind to, shaking up the old order, undermining the status quo, racking up points for habitual losers and the downtrodden. She's smart, gets reasonably high grades, does well in sports and is not at all bad-looking. She has her admirers and her detractors. To those who want things to go back to the way they were before she had the temerity to move into the advanced class, she's the problem. She's got her weak spots; her easily wounded pride, her short temper, her brittle confidence, and her detractors sense this. Like a shy, insecure girl with a traumatized past, unsure of her own beauty, nervous, emerging China doesn't take the prom for granted, but wants a prom night perfect down to every last detail, to show herself, if not the others, how far she's come, to give her something to hold on to, to cherish and remember forever. And that's where the incessant taunting and bullying by boycotters --jealous detractors, opportunists and implacable foes-- gets outright scary. Remember the bloody prom scene in Carrie? Stephen King's horror classic is disconcerting and haunting in a lingering way because of its solid psychological underpinnings about bullying gone awry. In the film version, Sissy Spacek embodies with unnerving skill the role of a shaky young woman emerging from trauma, facing the future with a nervous smile. Carrie is trying hard to escape her past, willing to deny her own not inconsiderable powers in order to be accepted, wanting so bad to be like the others, to be liked, that she, who is capable of so much more, craves the most mundane of accomplishments, of going to the prom, of being included, only to be set up for a fall. The humiliation that unfolds in what was to be her moment of glory is excruciating to watch. And then she breaks down and things start to unravel. She can't stop herself, even though it pains her, even though she knows it is wrong. Holier-than-thou human rightists who clearly find it easier to pick on China rather than tend to more egregious violations in their own backyard contribute to the enmity. Unthinking nationalists, rag-tag hooligans and agit-prop activists who are looking to spoil China's shared moment of glory by disrupting the Olympics, whether it be in the name of asserting Western values, Darfur, Dharmasala or just for the hell of it, may find the wrath of the Chinese people, once riled up, unruly and liable to spiral out of control. What good can the gratuitous and unthinking humiliation of a trauma-racked nation of 1.3 billion people possibly serve? The antic cheerleading of demonstrations seen in recent weeks, when not outright rude or violent, has the one-sided nature of school spirit, being true to one’s school at the expense of others. In trying to bring attention to one set of problems without thinking through the consequences of attention-grabbing shocks, racist chants and media stunts, a whole new set of problems is set into motion. Racially-tinged currents of rejection, betrayal and resentment are surging to the fore in a new, yet wholly unnecessary, confrontation between East and West. Sometimes when a consultant tells me that Afghans lack capacity, I try to imagine my interlocutor being forced to survive in Uruzgan province with two jaribs of land and a goat. I wonder if this person would be capable of transferring billions of dollars from undocumented workers in the Persian Gulf to families living in remote villages with no banks or telecommunications. I wonder if he could transform a local conflict incomprehensible to outsiders into a million dollar business funded by superpowers that h have been convinced they have existential stakes in the outcome. I wonder if he could smuggle emeralds out of Afghanistan to buy weapons and ammunition in Ukraine and transport them across seven closed borders into the Panjshir Valley. I wonder if he could create a multibillion dollar a year industry in one of the world’s poorest countries with no government by turning those handicaps into assets in a world with an insatiable demand for illegal addictive substances. A brief examination of the people of actually existing Afghanistan indicates that they do not lack capacity. If they lacked capacity, they would be dead by now. But they have developed capacities to deal with their actual situation over the past several decades. During that time, the ability to apply for a grant from USAID was not particularly useful. Intelligence agencies are much less demanding of financial accountability and deliverables. Instead, Afghans developed capacities that enabled them to survive and in some cases prosper under conditions of insecurity and high risk. In order to transfer money from migrant workers to their families, they developed extensions of the longstanding havala system. This system, which long took advantage of the movements of nomads and traders to transfer letters of credit between hinterlands and commercial hubs, has adapted to the age of telecommunications. Money can be transferred electronically from an account in Saudi Arabia to an account in Pakistan. A dealer who has been contacted by either a personal emissary or mobile phone withdraws the cash. A personal emissary, a traveler, nomad, or trader, or a mobile or satellite phone call courtesy of the CIA and other intelligence agencies, who supplied them to commanders, can inform the recipient, who can come to the city or town to collect. Or the agent can use the cash to purchase goods in a market center and then transport them for resale at a profit in the destination area. He transfers the original amount to the recipient and keeps the profit and costs as his fee. All of these transactions rely on networks of social capital underpinned by kinship, religion, fear of retribution, and other forms of reciprocity that operate in the absence of a state or without support from it. Among the legacies of decades of conflict in Afghanistan were hyperinflation, a debased currency, and the circulation of multiple series of banknotes of different origins. Printing currency was a way for leaders with weak administrations to leverage a degree of international recognition into flows of cash, and they did so from the late 1980s on. Therefore, as part of the process of establishing peace, stability, and accountability, the Bonn Agreement of 2001 called on the interim administration of Afghanistan to establish a new central bank to emit currency in a transparent, accountable fashion. In 2002, when the Afghan government decided to implement this measure by demonetizing the old currency and issuing a new one printed with advanced technology, the IMF told the government that Afghanistan lacked the capacity to carry out such a change, as it had no functioning banking system. The IMF recommended dollarization of the economy instead. Under the leadership of Minister of Finance Ashraf Ghani, the Afghan government rejected this argument and succeeded in changing the currency within a few months (see the account by Ghani and his collaborators in their chapter in this book). The exchange was completed without incident in early 2003. The International Security Assistance Force, then under the command of Turkey, refused to provide security for an operation that required the transport of billions of dollars worth of cash through a war-torn impoverished country with no functioning police or courts. USAID promised to supply helicopters to transport the currency notes but lacked the capacity to deliver them, as it was unable to obtain the required insurance. As international actors either lacked or would not use their capacities, Afghanistan carried out this change using its own capacities. The major obstacle encountered was the lack of physical capacity to burn the old notes as quickly as they were turned in. How did they do it? The Afghan government used and developed the existing capacities of the society, rather than assuming that these old capacities either did not exist or had to be replaced with new, imported capacities. The Afghan government convened the havala dealers and worked out an exchange system with them, tapping into their tremendous knowledge of the functioning of money markets and monetary transfer systems in Afghanistan, as well as their connections to traders and other economic actors throughout Afghanistan. Since international actors were unable or unwilling to assist with security, the finance minister requested the assistance of the minister of defense. At that time the Minister of Defense, Marshall Fahim, commanded the militias who had fought the Taliban, not a professional army. He and the Minister of Finance, Ashraf Ghani, were political opponents on many issues, including the issue of the future of the militias that had fought the Taliban. Nonetheless they were able to reach agreement on the currency exchange on the basis of national interest. The leaders of the militias in question are now members of parliament or government officials, and their militias have been largely demobilized. The currency has remained stable, and Afghanistan’s monetary reserves have increased from virtually nothing to several billion dollars. Many of those demobilized have entered the opiate industry. This industry, whose yearly export value of over $3 billion is estimated to equal half of the licit GDP in value and to constitute the bulk of the cash economy, is also a major reason that the new currency has remained stable and that Afghanistan’s foreign reserves have increased. After ignoring the opiate economy for several years during which the US backed protectors of drug trafficking as allies in the war against the Taliban and al-Qaida, policy has now shifted. The entry of the US into counter narcotics policy, like its entry into other areas of “nation building” originally rejected by the Bush administration, is welcome, as it holds out the potential for the needed funding and political support for the difficult endeavor of converting Afghanistan’s economy from an illicit one depending for protection on illegal armed groups into a licit one relying on the apparatus of the rule of law. This transformation is fundamental to the establishment of peace and stability in Afghanistan. Let’s look at the drug economy from a different angle, as a high-capacity adaptation to indescribable devastation. This suggests that, like the transition to a new currency, the transition to a new, licit economy should use the existing capacities developed over the past few decades. Entrepreneurs have established a multibillion dollar a year business in Afghanistan. They have leveraged the country’s main weaknesses – poverty and the lack of security and rule of law -- to make billions by producing an illicit addictive substance for which there is an insatiable demand. They have created a value chain starting with the extension of agricultural credit to farmers in the most remote areas through a network of traders. These traders offer futures contracts for the product to farmers, guaranteeing them cash to feed their families through the winter and a market for their finished product. Through these futures contracts farmers are guaranteed both cash income and a market, simultaneously. Small industrial enterprises, dispersed in remote areas to avoid detection, transform this raw material into heroin, a high-value, low volume product, using state of the art technology. This technology requires the importation every year of thousands of tons of acetic anhydride, a substance not manufactured in Afghanistan. Someone is paying suppliers in the neighboring countries for this industrial material and smuggling it into Afghanistan to supply the labs scattered throughout the country. Traders in turn purchase the refined material or pay the labs to process raw materials and then arrange to transport the product across the border through the use of ethnic and tribal ties as well as various types of militias. To ensure the settlement of disputes and the security of the operation, the economic actors all along the value chain have established a shadow system of governance, involving local councils, bribed officials at all levels of the government, and flexible arrangements with a large variety of armed groups. Such a criminal industry was the only possible large-scale economic activity in the past several decades, and a large portion of the Afghan population has participated in it. Thus a country that long largely relied on subsistence farming for food production has now developed a massive sector of commercial agriculture for the international market, with the associated financing, insurance, production, agricultural extension, marketing, and trading activities. David Mansfield, who has spent over a decade of field research studying the opium industry in Afghanistan, characterizes this industry as an adaptation to a situation of high risk. Many aspects of the business model, and in particular the way that relations between traffickers/processors and cultivators are structured, function in such a way as to reduce and spread risk among participants in the industry. Discussion of alternative livelihoods often is reduced to crops for farmers. But the opium economy creates more non-farm than farm income. Some of that income goes to traders who purchase opium in villages or in bazaars. Many of these traders also act as lenders and purchasers of futures contract. These small and medium traffickers correspond to the hawala dealers in the currency exchange. They have the detailed knowledge of the credit and marketing needs of the farmers that any new rural economy would need in Afghanistan. Rather than eliminated or targeted, they should be integrated into new institutions that make use of the skills and networks they have developed. For instance, they could be offered an amnesty in return for capitalizing new rural credit institutions. Each trader/lender will have the authority to make loans for a set of defined purposes for which the institution is established, including futures contract purchases of any licit agricultural good. In order to reduce risk, the government with the support of International Financial Institutions should establish some kind of loan guarantee or insurance scheme to encourage a higher volume of credit without exorbitant rates. The subsidy, guarantee, or insurance should assure that the cost of borrowing from this new institution will be significantly less than the cost of contracting debt through the salaam system or with opium as collateral. The agricultural lenders would need technical advice, but they could certainly also supply technical advice, given their experience. In provinces where little or no opium is grown, there will still be traders or landlords who operate as lenders. Some of them could be recruited and new employees trained to create a credit and investment institution similar to what the opium economy has established elsewhere.